At Petcurean, we create our recipes with passion and purpose, using only the best of the best ingredients from a trusted network of farmers, ranchers and producers. Petcurean Pet Nutrition produces recipes for dog breeds of all sizes, and cats and dogs of all ages; recipes that are completely grain free, as well as recipes made with grains, as there are pets that can benefit from grains in their diets. Our GO!™ product line provides solutions for your dog or cat's unique dietary needs, with high protein, lower carb recipes that help your pet stay strong and fit; recipes formulated for cats or dogs with food sensitivities and specific nutritional needs; and recipes that provide preventative care to keep your pet healthy for life. The Prize: One lucky dog or cat or both (but one house) will win a $150 of Petcurean GO! 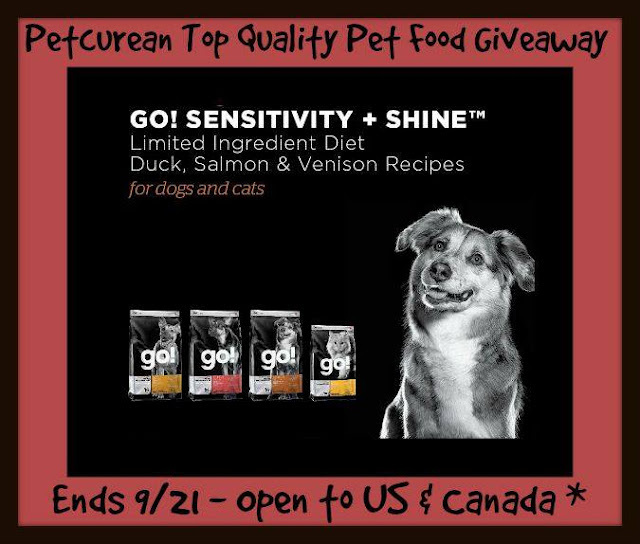 Limited Ingredient Diet SENSITIVITY + SHINE premium pet food in the form of free product coupons (covers the purchase price of the food - excludes applicable taxes). The winner can use it for cat or dog food or a combination of both, the choice is yours! Just make sure that your local store/s carry Petcurean such as PetSmart and other retailers. I have 4 cats, Tom, Ms Priss, Budge, and Houdini! All would enjoy trying Petcurian!